Choucroute is an Alsatian dish and if you know your history you know this area has always been a bit of a sticking point between France and Germany throughout the years. 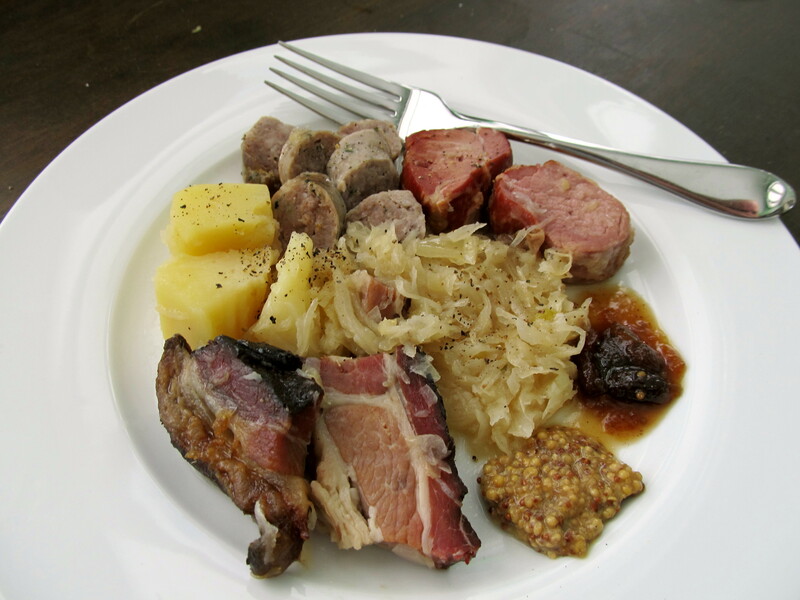 German influence can easily be seen in the main ingredients for a basic choucroute: sauerkraut, potatoes, smoked pork, and frankfurters. Doesn’t look too French does it? But it is and of course the French have fancier versions like one made with duck and Choucroute Royale, which uses champagne instead of Riesling. In the end as long as you have sauerkraut, some cured meat, and potatoes you’ve got yourself choucroute. Anthony Bourdain and Julia Child both have choucroute recipes and are similar to each other, though Julia’s has carrots in it which is apparently unheard of (ah there’s the French influence, strict local food rules). Bourdain’s was a little easier and even though I didn’t have all of the ingredients he called for, I was able to improvise pretty well. Instead of using smoked pork loin and frankfurters I put in smoked pork tenderloin, some of my home cured speck, and some of my homemade onion brats. Pretty good substitutes if I do say so myself. Now if you don’t have a German meat market in your neighborhood (like we do) sourcing some smoked pork loin or tenderloin might be a problem. Same goes for the pork belly. But that’s a great thing about choucroute, it’s very easy to change things around. Smoked ham (like speck) or a smoked pork hock and salt pork or bacon can easily be substituted and make the dish just as good. If you are able to get some fresh pork belly it’s very easy to salt it. Simply place the belly in a bowl, cover with kosher salt, and refrigerate overnight or for two days. When ready to make the choucroute just rinse off the salt, pat dry and add it to the pot. It’s really good too. You may have noticed there isn’t anything which looks like pork belly in the photo above. Good reason for it. Other than salting the pork belly you really don’t need to do much deep prep work. Throw everything in a pot and simmer for an hour and half, cook some potatoes and sausage to add to the pot, then serve a big ole bowl of meat and cabbage. Mustard goes great with the dish but at the risk of offending an Alsatian I think adding something sweet like a good apple chutney (or my apple onion chutney) balances out the saltiness. Probably a faux pas like the carrots. International relations aside, choucroute is a great easy dinner for a cold winter night. Drain the sauerkraut and rise in a colander. Set aside. Heat the oil in a large Dutch oven over medium-high heat. Cook the onion for 5 minutes. Add the sauerkraut, juniper berries, coriander seeds, garlic, wine, and bay leaf. Bring to a boil then reduce heat to a simmer. Add the pork belly, smoked pork tenderloin, and speck, then simmer for 90 minutes. When you have about 40 minutes to go, Bring a large pot of salted water to boil over medium high heat on the stove. Peel and quarter the potatoes. Add the potatoes and sausages, reduce to a low boil/simmer until cooked. Sausages should be done when the potatoes are. If not remove the cooked potatoes and continue cooking the sausages until finished. Serve a piece of each with sauerkraut along with mustard and a sweet chutney. This looks delicious! Like a meat lovers pizza for the gourmet. Thanks for sharing. Kind of! But without all that bread filler! This looks fabulous. If I didn’t care about my waistline (not that I have a waist anymore) I would eat this every day. Love that cookbook. I was lucky enough to have something so similar a couple of times in Colmar, Alsace. Addictive. People who think they don’t like sauerkraut are really missing out!!! Thank you! It really is delicious and a great winter dinner. They are!